UP gets 70,784 more houses for urban poor under PMAY(Urban). Karnataka gets 56,281 more; Andaman & Nicobar Islands get 609 first time. 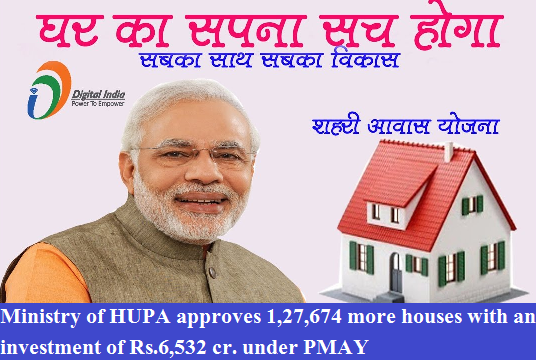 Ministry of HUPA approves 1,27,674 more houses with an investment of Rs.6,532 cr. Central assistance of Rs.1,915 cr approved for these new sanctions. Ministry of Housing and Urban Poverty Alleviation has approved construction of 70,784 affordable houses for the benefit of urban poor in Uttar Pradesh under the Pradhan Mantri Awas Yojana (Urban) with an investment of Rs.3,528 cr for which central assistance of Rs.1,062 cr has been approved. Further to the discussion Minister of HUPA Shri M.Venkaiah Naidu held with the Chief Minister of Uttar Pradesh Shri Yogi Adityanath soon after assumption of office, the State Government sent affordable housing proposals for 145 cities and the same have been approved. Earlier, Uttar Pradesh has been sanctioned 41,954 houses including those approved under Rajiv Awas Yojana, which has been now subsumed under PMAY(Urban). With these latest approvals, the total number of houses sanctioned for Uttar Pradesh has increased to 1,12,738. Of the 70,784 houses approved, 56,839 will be constructed under the Affordable Housing in Partnership component and 13,945 houses under Beneficiary Led Construction component of PMAY(Urban). Under these two components, central assistance of Rs.1.50 lakh is given to each beneficiary. Karnataka has been sanctioned 56,281 more affordable houses for 93 cities and towns with an investment of Rs.2,950 cr and Central assistance of Rs.844 cr. Bengaluru has been sanctioned 8,291 houses, Bellary-1,613, Shivamogga-1,500, Chennapatna-1,450, Hubbali-1,300, Dharwar-1,292, Challakere-1,127, Kanakpur-1,163 and Sira-1,008. For the first time, Andaman & Nicobar Islands has been sanctioned 609 houses for Port Blair with an investment of Rs.54 cr and central assistance of Rs.9.00 cr.